 Log In needed $5 · Point Zero medium blue shirt. Point Zero blue shirt. Medium. Used but great shape. $5. I have a large amount of clothes for sale and they are individually priced. I will also sell as a whole for $100 just to make it easier. There's a total of 52 items. Here's just a few. 1. White Jean shorts. Size 27. Used but great shape. $5. 2. Le Chateau black dress pants. Size 4. Like new condition. $10. 3. Suzy Shier white pants. Small. Like new condition. $10. 4. Take 5 workout/pajama pants. Black. Small. New condition. $5. 5. Black skirt. Small. New condition. $5. 6. Black crinkle skirt. Small. New condition. $5. 7. Suzy Shier blue going out shirt. Small. Used but in decent shape. $5. 8. Black/white stripped with blue t-shirt dress. Small. New condition. $5. 9. Reitmans black shirt. XS. New condition. $5. 10. Lanzea collection purple shirt. Medium. New with tags. $10. 11. Jessica stripped color tank top. XS. Used with tiny paint stain. $2. 12. Point Zero blue shirt. Medium. Used but great shape. $5. 13. Weekender Ladies Wear throw over coat. White. Small. Used but decent shape. $5. 14. Pinkish workout shirt. Medium. Good shape. $5. 15. Black with white yoga pants. Used but great shape. $5. 16. 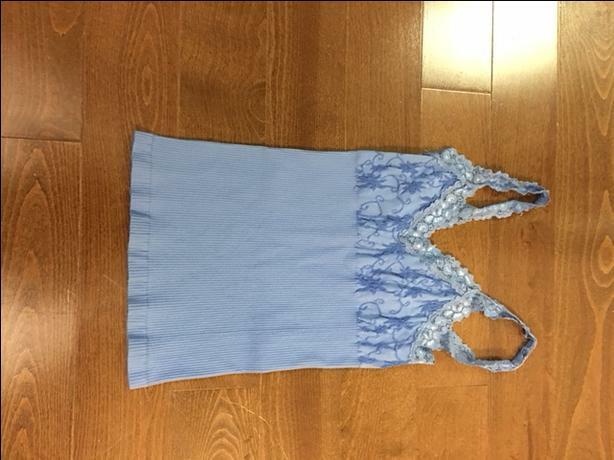 Ricki's blue undershirt. Small. New condition. $5. 17. Reitman's maroon undershirt. Small. New condition. $5. 18. Black dress shirt with CC. Small. New condition. $10. 19. Liz Claiborne black shirt. Small. New condition. $5. 20. White U2B throw over shirt. Great shape. $5. 21. Royal Robins button up shirt. Large. Used but great shape. $5. 22. Guinness shirt. XL. Used but decent shape. $5. 23. Cleo brown dress coat. Small. $10. 24. Hinsan blue youth hoodie. Large. Used. $5. 25. Black scarf. Used but good shape. $5. 28. Red scarf. New condition. $5. 29. Surrey Classic black suede jacket. Used but great shape. $10. 30. Le Bon Bon Paris pink jacket. Large. Used but great shape. $10. 31. R Petites blue and green jacket. Size 6. Used but great shape. $10. 32. Tribal coat. Black. Size 8. Used but great shape. $10.